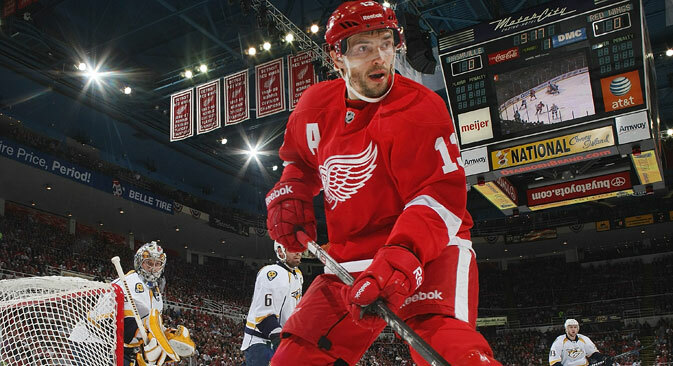 Russian correspondents say Pavel Datsyuk is the season's superstar. What more can be said about the phenomenon that is Pavel Datsyuk? Just as his Red Wings team is a nailed-on certainty to reach the Stanley Cup play-offs year after year, so Datsyuk can be relied upon to produce big numbers with metronomic regularity. The venerable center is now the last remaining member of Detoit’s 2002 Stanley Cup-winning roster, making his NHL breakthrough in that same season. And news of his three-year contract extension in the Motor City put an abrupt halt to speculation that he might follow Ilya Kovalchuk back home to Russia after a successful stint with CSKA Moscow during the lockout last fall. This summer, Pavel Datsyuk signed a new, three-year contract with the Detroit Red Wings and can now feel comfortable playing just for fun. Datsyuk chose Detroit despite previously receiving a lucrative financial proposal with Kazan Ak Bars of Russia’s Kontinental Hockey League. The offer was comparable to the new contract of Ilya Kovalchuk with St. Petersburg’s SKA, but Datsyuk made ​​a choice in favor of the NHL and will continue to delight fans of Detroit. Datsyuk has a great relationship with Detroit’s general manager and executive vice president Ken Holland, and with Mike Babcock, the team’s head coach. The entire team highly values Datsyuk for his brilliant action on the ice and his sportsmanship. In addition, Datsyuk was one of only two representatives of NHL clubs allowed to the KHL All-Star League match. The other was Kovalchuk. His inclusion in the match is very revealing.